Potty seat or chair? Boys vs Girls? We go over what to look at and give you our best potty picks. Shopping around for a potty training seat can be quite frustrating when you see just how many of them there are on the market. You probably have so many questions, and it may all seem like they are just all too similar to one another. First, consider whether you have a boy or girl. Boy chairs need a splash guard, but sometimes they can also be good for girls. A unisex chair may actually be a great choice to prevent messes. Another thing to consider is the safety and comfort of the design. Safety is important, obviously. As far as safety goes, choose a non-slip chair that will keep your child secure while they are sitting on the toilet. You may also want to consider handle grips, as this just helps your child feel more comfortable and secure. Finally, consider an easy to clean material that will not harbor germs. If it is hard to keep it clean, chances are you will want to replace it sooner than later. Make a better decision for your budget, and get one that you will be able to keep clean. Just to clarify, this article covers both potty seats and chairs. The main difference is that the seats are simple rings that fit over the adult toilet seat. 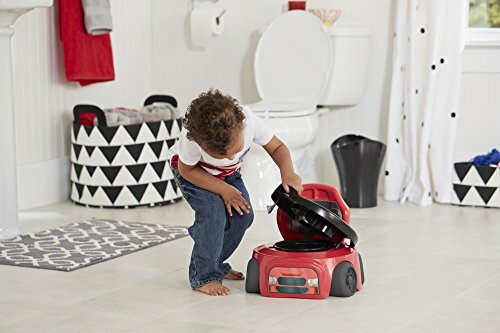 We’ve done separate reviews below for potty chairs that sit on the floor so toddlers can get on and off them by themselves without being hoisted up on and off an adult-sized toilet. We start off without top picks here are for potty training seats (that sit directly over the adult toilet seat), if you are looking for potty chairs we’ve also covered those please scroll down. We’ve separated them into different groups since there are actually seats made for boys (pee splash guard) and girls (no splash guard). To make it easier and save you time, here are our top picks but please scroll down to see our full, detailed reviews of all the other potty seats and chairs we’ve reviewed. 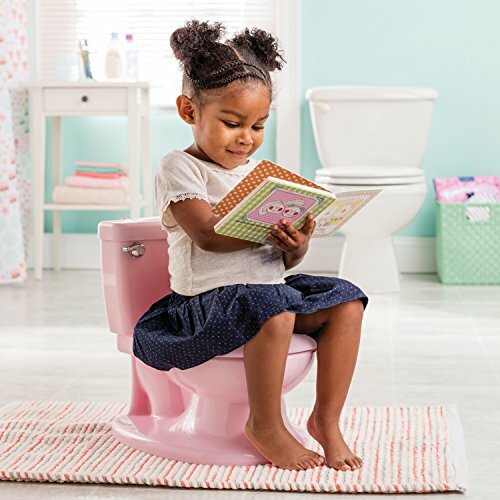 If your toddler is outgrowing the chair and you think they are ready to start using the big toilet- see our separate article if and is ready for a good potty training seat with a ladder. Toddler sitting on a Potty chair. One potty training seat that really caught our eye was this design by Cozy Greens. It is not only ideal for round toilet seats but also oval toilet seats, giving you some added versatility. It also has some other great features, including a fun chart to help keep your child on track with potty training. It has a built in splash guard that helps boys to keep their pee in the toilet where it belongs but is also ideal for girls as it is unisex. It has an anti-slip comfortable design that your child is sure to love. The anti-slip helps them to stay safe, and comfort makes them want to use it more. It has a hook that allows you to store it safely on your bathroom wall with a suction cup. This keeps it off of the floor, and out of the way. Some parents have noted that it seems a bit wobbly when their child is sitting on it. This may lead to them feeling unsafe. The splash guard has been noted to be a bit on the smaller side, making it more difficult to prevent messes. Next up, we have our favorite by Fisher Price. They have been a leader in the industry for quite some time, and are a well-trusted brand name. Here are some features that make this chair stand out. The stylish and rounded design helps to make sure that your child feels safe and secure. Unlike flat toilet seats, this one has ridges and dips in all the right places. The splash guard is pretty high, making it suitable for both boys and girls. It is really easy to use. Simply set it on top of your toilet seat, and it is ready to go! It has a convenient hook that makes it easy to store on the side of your toilet so that it is nearby when you need it, but not in the way. It does not fit as securely on seats that are padded. This is why they recommend against using it on padded toilet seats. It makes the toilet seat sit up higher, so you may need a step stool for your child to reach the seat. Finally, we have the First Years Soft Grip Trainer Seat. It has a one-piece design that is easy to keep clean, and also easy to fit onto any toilet seat. Check out some of its other features. The seat is pretty wide, making it great for kids of all sizes. The handles are even widely set, for added comfort and security. There is a high splash guard that helps to keep messes at a minimum for little boys. The raised back also adds a touch of comfort and stability for your child to lean back some while using the toilet. The ridges on the design of this seat tend to be a little more difficult to keep clean. The splash guard is not removable, and it may actually get in the way a little bit for girls. It does not work as well on toilets that have an oblong shape, as it is more designed for round toilet seats. We really love the Summer Infant My Size Potty because it looks so much like a real toilet. Not only easy to clean, but it also has features that will help to teach your child to flush and stay hygienic. It also has some great features that give it just a little boost above some of the others out there. Let’s take a closer look and see why it may be a great choice for your little girl. It actually makes your kid feel like they are flushing the potty, just like you! This gives them added confidence in what they are doing. It is easy to take apart to keep it clean, with an easy to remove bowl that just lifts out. It has a slot to keep your baby wipes, which keeps them close by for your child to use them after toileting. This promotes healthy hygiene habits. May not be ideal for older toddlers who have gotten taller. It does not actually flush, which means you still have to take the bowl out and clean it. The flushing mechanism is really just for looks (and fun)! Next up, we have the Fisher Price Custom Comfort Potty Training Seat. This seat is actually designed just for girls and has a cute, stylish design. On top of that, it also has some other noteworthy features for you to keep in mind. This chair is actually adjustable. You can choose from two different height settings allowing it to grow with your child. It has comfortable armrests and a high back that makes your child feel like they are secure when they are on the chair. The bowl is easy to take off and keep clean, making it an ideal chair for those that want something that offers a one-step cleaning process. The bowl is so easy to remove that your child may actually take it out and try to play with it. Some parents have reported this. There is no lid for the potty chair. The chair is pretty narrow, and may not be suitable for larger children. 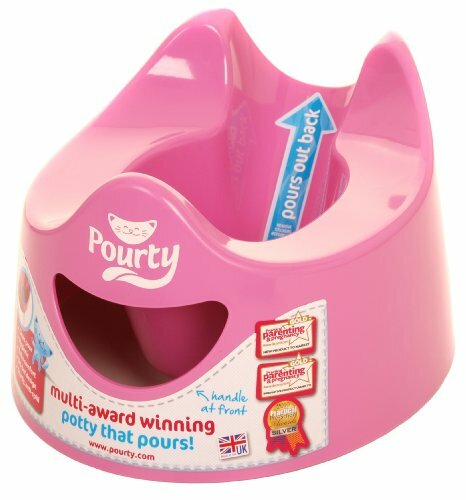 Here we have the Pourty Easy to Pour Potty. This potty chair is really easy to clean, as it is all one piece. It also has a stylish design. Let’s see what else it has to offer. There is no reason to take this chair apart, as it has an easy to pour lip on the back to help you empty it with ease. This is perhaps one of the biggest advantages. It has a pretty wide seat, making it ideal to grow with your child. Some other chairs on the market may be pretty narrow, but this one has more than enough room. It even has a splash guard, which may not be essential for girls, but can still help to ensure there are not any accidental splashes that come up if your child sits wrong. The seat is actually really low. This may make it harder for taller children to sit down. When pouring the waste out the back of the potty chair, there may be a bit of dripping due to the design of the chair. It can be easily rinsed afterward, though. The bottom does not have any type of non-slip grip, which may make it slide around a bit on the bathroom floor. Next, we have reviewed some of the best potty training chair options for boys. The main distinguishing feature here is the addition of a splash guard. This feature is especially useful for boys since it helps prevent pee from whizzing all over his legs, on to the floor or halfway across the room! First up is the Summer Infant My Size Potty. This potty chair is pretty adorable, and it looks just like a real toilet. It also has a lot of great features that make it an ideal training chair. It has a flushing sound that makes it sound like a real toilet. This can help to boost their confidence and teach them the importance of flushing. The lid lifts easily so that you can remove the bowl and clean it easily after each use. There is a handy compartment to keep baby wipes, teaching your child good hygiene habits after using the toilet. The splash guard tends to fall off sometimes, which can lead to a mess. You may have to reposition it often. It is a bit on the smaller side, so if you have a larger toddler then it may not be the right choice for you. Some consumers noted that the chair slides on tile flooring, but it really just depends on how slick the floors are. Finally, we have a fun choice that any boy child is sure to enjoy. This one looks like a race car, and this can be a great way to attract your toddler to the toilet. After all, sometimes kids have a tendency to steer away from it at first. Here are some other features. It also has a removable seat that can be used to put on top of your adult toilet, allowing the chair to grow with your child. The splash guard on this chair is higher than some of the other seats that you find on the market, meaning less mess to have to clean up later. The seat is extremely safe. It has security handles and also has non-slip grips on the ‘wheels’. Some parents say that the seat is a little too low to the ground, making it a little more difficult for taller kids to sit comfortably. Some kids may think that it is a toy, rather than a potty chair. What is meant to draw them to it may actually be a distraction for some kids. The Multi-Stage 3- in-1 Potty by Munchkin is another great choice for a potty chair. We really loved the grow with me feature. This isn’t the only great feature that it has to offer. Let’s take a closer look. It has a 3-in-1 design, allowing it to be used as a potty chair, seat cover, and even a step stool. This is what we mean when we say the ‘grow with me’ feature. Keep odors at bay with Arm & Hammer deodorizing discs. These are sold separately, but this is a great added bonus to keep the potty chair smelling fresh. The bowl is easy to remove so that it can be cleaned easily. The potty chair part is designed mainly for smaller tots. Larger toddlers may actually have an issue with the splash guard. It has a holder for wipes, but it is difficult to get to them when sitting on the potty chair. The lid is a tight fit, so it may be difficult for your child to open and close it without help. As you shop around for the best potty training chair for boys, there are a few things that you will want to look for. One of the main things to consider is a chair that is specifically designed for boys. This means you will want it to have a pee splash guard. Without this, you may find yourself cleaning up messes each time your little boy uses the chair. If are looking for a good potty chair for girls click here…or just don’t think you need the splash guard. It is also a good idea to choose a chair that will be easy to clean. Some potty chairs will come apart easily so that they can be washed and dried after each use. Potty chairs tend to get gross pretty quickly if you don’t clean them regularly. You don’t want it to be a hassle each time you have to do it. An added plus is an antibacterial potty chair. Consider a potty chair that will grow with your child. Some potty chairs will actually turn into a step stool that can be used to help your child get up on to the regular toilet when they are ready to start using it. 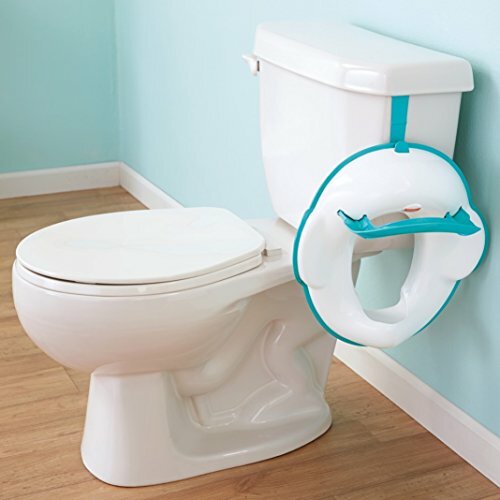 This can be a great feature in a potty chair. Shopping for a potty chair for girls is different than shopping for a potty training chair for boys. There are different things that you would want to look for. For instance, with a boys chair, a splash guard is important. It is not really that important when it comes to a chair for girls. Look for a comfortable design first. 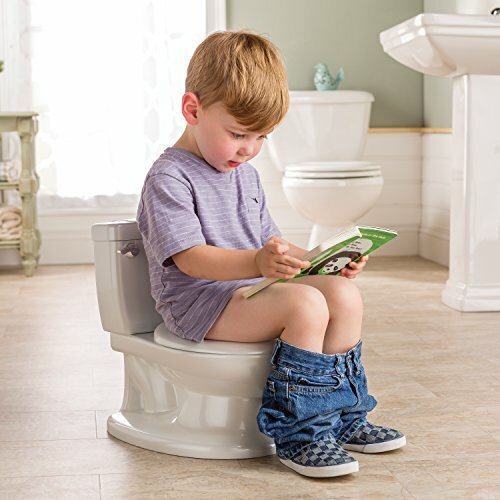 Your child needs to be comfortable while sitting on their potty, or they may not really be very receptive to it. Look for a chair that is contoured or one that has a soft padded seat. This can really make the whole potty training thing go a lot more smoothly for both you and your child. You will also want to find a chair that is easy to clean. The problem with potty chairs is that they get dirty quickly, which is to be expected. Chairs that can be taken apart easily and cleaned is important because it makes clean up time easier, and saves you some hassle. There are some really great potty training seats out there for both boys and girls. We have covered some of the top picks, and given some great reasons why these are such a good option. 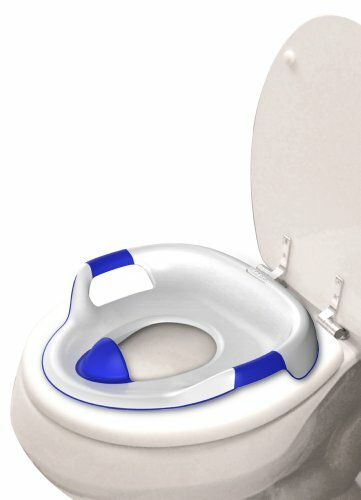 While we do really like the Fisher-Price Perfect Potty Ring the best since it has a unique design that offers maximum comfort and security and is also really easy to keep clean, the others are great options as well. Let us know which one you like best. If you think your child is ready to climb up onto the big toilet, check out these toilet seats with built-in ladders…which are a good option for kids that are transitioning to an adult toilet but are still not tall enough to get up on their own without a boost- this option gives them more independence and relieves parents from having to lift them on and off the seat every time they need to use the potty. For boys, a newer accessory on the market in recent years are training urinals. These are good options for boys that need to practice their aim and get comfortable with a urinal so they can use them when they start preschool…or need to go pee in a public restroom.